As the Strategic Serialized Email Series continues, Andre talks about the magic of autoresponders, how to keep your emails relevant, and how to make people look forward to your next email. James: James Schramko here. Welcome back to SuperFastBusiness.com. You’ve arrived at episode 2 of a multi-part podcast series. In fact, I’m speaking with my special expert guest Andre Chaperon on the topic of strategic serialized emails. Welcome back, Andre. Andre: It’s great to be back. James: In our last episode, we were talking about the goal of emails. We talked about rigging your system for relevancy. If you haven’t listened to that episode, please go back and listen to that because it will really get you in tune with what we’re talking about on today’s episode. Today, we are digging right into some strategy for your emails and how you should be looking at them as an overview. So when you sat down and thought about your email strategy Andre, what sort of things come to mind? Andre: OK. So the strategy for me is about achieving the goal or making that goal relevant. So we spoke about the goal already, which for me is relevancy. So the whole strategic part of it is about delivering on that. So one of the things that I guess I’m most famous for is the way that I structure the emails and the way that I kind of verbalize it is choose your own adventure. So choose your own adventure allows you to be super relevant because people self-select and depending on their behavior, they get sent to different types of emails. So it keeps that relevancy super high. I don’t know, I’m guessing people understand the whole choose-your-own-adventure model. James: Well certainly my audience are definitely familiar with the product chooser, which is the way that on my website, I’ve been able to funnel people into the right part of the website fairly quickly, and I learned a lot about that from a conversion expert. You’re doing the same thing with your emails. You talked in the previous episode about how you rigged that up with the first email system you’re using but it was a little bit difficult and that modern email systems will give you the ability to control where people end up based on what links they’re clicking on and what other things they’ve already purchased or not purchased or where they’ve been in your system, and you can now very, very clearly trigger different sequences. From what I understand about your overall strategy, you still really like having a high percentage of autoresponders versus broadcasts. Is that right? Andre: Yes. So that’s part of the strategic approach because I think it’s near enough impossible to be relevant all the time when you’re sending out a broadcast because there’s no automation involved. Automation is an amazing thing when you rig it this way because you can get your people better reading your stuff to self-select what’s most relevant to them and what interests them and then they ignore other parts. Trying to do that using broadcasts, good luck. That’s never going to happen. James: I agree with you. It’s definitely challenging and certainly, the way we’ve approached it is we segment our main broadcast by topic. So we have website topic, traffic topic, business topic. So for starters, we’re excluding certain audiences from the broadcasts. So that’s something you could automate or do manually. The second part is I guess we do what I call long line fishing. We send a weekly digest, which has all the content and multiple links. I know that breaks many rules that are out there in the email world, sending multiple links in an email, heaven forbid, and they’ll click on the one or two topics that might interest them. Much in the same way I receive emails from the Huffington Post or surfing sites. I’ll usually click on one or two of the links out of the seven, or eight, or 10 things on offer. So if we’re going to go down that news approach, which I’ve been doing with OwnTheRaceCourse, that’s one way to do it. But that being said, I’m still using a heck of a lot of automation in my business too. I’ve got all sorts of structured training programs that roll out. I’ve got automated follow ups for people who buy things, I’ve got automated follow ups for people who don’t buy things, but we’re thinking about it, and I’ve got automated follow ups for people who used to buy things but then stopped buying things to find out what’s happening. And of course we chase people up if they start disengaging with things where we can measure their engagement. So I’m a huge fan of email automation when done right, and I use it in my business too. So this is really the core workhorse for your business, isn’t it, these email soldiers out there, working away 24/7? Andre: Yeah. So I would think that 90% to 95% of all the emails that go out from our system are the automated ones, and then just 5% or 10% are manual broadcasts, much like you do them. I have a pretty good idea of who I’m going to send that broadcast to. So it’s almost never to the entire list. James: I think the thing you really do, and we’re going to drop the hammer home on this, is you serialize your emails. You’re actually creating story-based emails and you even coined a phrase that the whole industry uses now, soap opera sequences. I know we’re going to go deeper on the tactics of that in our next module, module number three on this episode series, but right now, just as an overview, tell us about soap opera sequences. What does it actually mean? And also, while we’re at it, we should probably explain what an autoresponder is, just in case someone doesn’t know what that means. Andre: Yeah, OK. So let me address these few things. First of all, I’m assuming everybody knows what choose your own adventure is, but just to dumb it down, it’s back in the days when I was young, I used to read these books, these choose-your-own-adventure books. You read the stories. So that’s the story component, and then it gets to a page, should you go left or should you go further into the forest? Turn to page 26 to go left or page 17 to go forward. So that’s how I first was exposed to the whole choose-your-own-adventure thing, and I thought it was magical because I didn’t know what was going to happen and I felt that I was being a part of what that outcome was going to be, whether I was going to die or live, if it was some sort of adventure book. So that’s what got my mind around the whole choose-your-own-adventure thing. And then many million years later, I applied that to email. So that’s that component. So the story component is it needs to be some sort of narrative that plays out over multiple emails and at certain points like you mentioned, you can get people the opportunity to click one link, or two links, or five links or whatever. There’s a company worth following called fool.com, The Motley Fool, and they do some pretty good emails. They’re a finance company, or they have a financial newsletter. Because that’s a very, very broad subject, there’s different reasons why their audience is reading their stuff. They can’t presume too much so that very first email that you get when you subscribe to whatever their free newsletter thing is, the very first one, this email basically has something like four links. So there’s a setup, there’s like some context, “Thanks for subscribing to the Fool. So we can better customize the experience that we’re going to send to you, let us know of these four categories that you’re most interested in.” And each category has a person that they’ve set up that’s basically the face behind that category. So if you’re here for investment, Joanna is our investment lady in this picture here. If you’re here for retirement purposes, Jonathan is your guy. Based on what you click on, that’s going to rig the entire system. All the emails that are going to come to you later on are going to be based on that self selecting. So that’s how they’re making their emails relevant from the get go in a very broad market. So that’s essentially what it is. And then perhaps different to everybody else is I’ll tell these stories that will play out over multiple emails. There’s a few reasons why I do that, and we can go into that, but yeah. If you just imagine watching your favorite episode of Lost, or 24, or my new favorite now called Billions, each episode plays out, there’s a cliffhanger at the end, you can’t wait to find out what”s going to happen next, and then it ends. It just breaks rapport and that’s the end of it. There’s all these emotions that you want to find out what’s going to happen next. If you really stop and think about, all the stuff that’s happening in your head, there’s a way to that using email. So then they’re looking forward to the next email, which is like the next episode. And that next email can be the next day or can be a few days later. You get to choose when that email goes out. You asked me to describe what an autoresponder is. So an autoresponder is basically an automated system where you can stack up emails, email one, email two, email three, and you can tell the system how many days is the gap in between each email. So email one go out now, email two go out one day later, email three go out two days after email two. It’s the sequential series of emails that go out automatically based on a time and format that you select. So that’s probably the most basic level. The cool thing with that is you now get to control the entire story, the whole narrative for when somebody adds themselves to that autoresponder to whenever it ends, if it ever ends, you get to control the context of the conversation. That’s how you can build that relationship with an audience very quickly without all these random broadcast emails. Broadcast emails, basically it’s the opposite to that. You’re writing the email, you have to manually write that email, click the send button, tag it to the whole list, and that email will then go out. But that’s it. It’s a one-off. If somebody subscribes to your email list a day after, they don’t get that email. And if that was a really, really amazing badass email, they’re never going to see that because they joined after the fact. So I’m very careful how I rig my system so that I’ll curate the context and that attraction in the beginning, so then by the time people do get exposed to any broadcast emails that I send out, I know there were the certain point in their life cycle that they know who I am and I’m not the strange person that they’ve just subscribed to my list, and now they’re getting some promotional email for some random product from somebody else. That’s a massive disconnect. James: Great. Very good example of choose your own adventure. You talked about what those soap operas look like. I know we’re going to go more into those tactics later. You’ve given a good definition of a broadcast. I guess just some technical stuff here, I suppose if you’ve been sending out amazing broadcasts, it would be nice to go through your database and see which ones had good responses and think about how you might re-incorporate those back into some kind of automated system. Would that be an action step for someone listening to this series perhaps under utilizing autoresponders? Andre: Yes. Yes. Exactly that. So certain emails are just going to resonate better than other emails. So I’m always aware that whenever I send out a broadcast email, whether it’s to the entire list, which is very rare, or just to a certain segment of that list, I’ll be aware of how that email is resonating with that group of people. Sometimes, emails, the whole angle or the hook or the subject line tied in with what you just said just hits home for them and they hit reply, and you could just tell that that email has an impact on them. But sometimes, other emails are less effective. But you try your best. Every single email that you send out is never going to be the best, amazing thing ever. It’s just about trying to be relevant all the time. And every now and then, when you get this amazing one, you can then re-incorporate that into the system as an automated thing. James: Right. You talked about this cliffhanger, and I know you’ve referred to them as open and nested loops. I think that’s the expression people would be used to hearing now that you’ve propagated it in the market. James: It basically means it’s almost impossible to unsubscribe from that email sequence because you don’t want to miss out on what’s coming down the track. TV has done this really well for many, many years. I mean even listening to the most basic broadcasting on TV now, like for us, we listen to the BBC news whenever it comes on. Although I’m not a fan of the news, but whenever they do start, they’ll mention all the topics right on the very first few seconds. Typically, the last one is the one that you really want to hear about, and then it will sequentially go through the list, and now you’re kind of stuck there waiting through all these irrelevant news that’s irrelevant to you because you want to hear that last piece. So I guess that kind of demonstrates what I’m saying. James: They’ll get the juiciest headlines. What is this expression, “If it bleeds, it leads.” And they’ll hold off delivering that until they’re ready so they can get that appetizing revenue. In fact, one good reason to send broadcast as part of your strategy is when you have launches, right? James: And we’re going to cover some launch tactics in the next episode. So that’s pretty much a good wrap as to the strategy. We talked about why this strategy is effective. We’ve talked about what some of the important elements are about choose your own adventure, about having a good mix of autoresponders there, healthy ratio compared to broadcasts, about story-based marketing and using all that drama and suspense, and open and nested loops. We’ve talked about the soap opera sequences and how this really is the silent sales machine in the background when you get it rigged up properly, to use Andre’s words. In the next session, we’re going to talk about tactics. In fact, remind me Andre to share with our listeners the tactic that you told me on how to actually write these soap opera emails on your computer, the easiest, possible way that are so simple and I still use to this day. So we’ll get to that soon. Andre, thanks for sharing this. 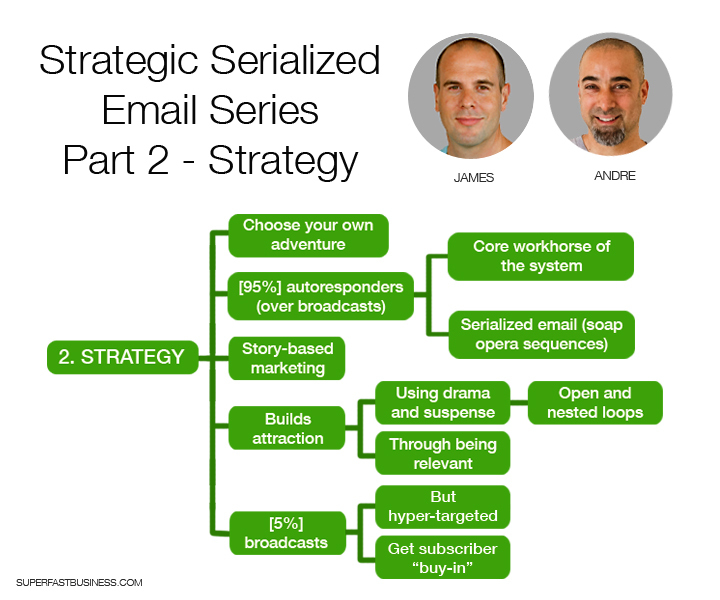 Remember to check out Andre’s website at Autoresponder Madness, and we’ll be back for part three of this amazing strategic serialized email series. Thanks Andre for sharing this stuff.